What Is "Je Suis Charlie": Why Did Terrorist attack In France? What Is “Je Suis Charlie” And Why Did Terrorist attack In France? 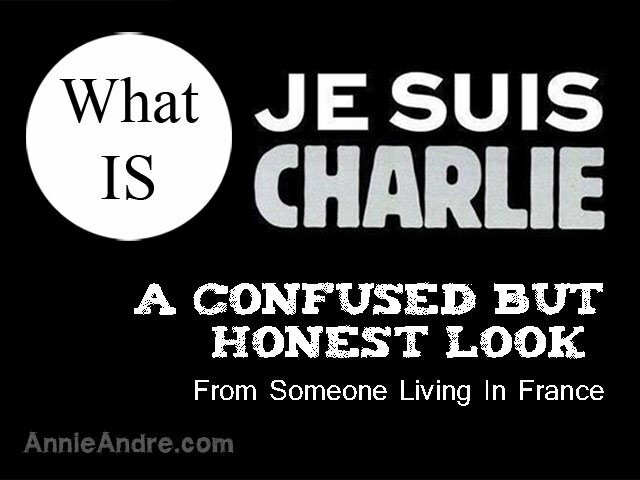 >> What Is “Je Suis Charlie” And Why Did Terrorist attack In France? Daughter: Are the bad people in Paris going to come here where we live? (We live in France by the way). My daughter was asking about the events on the 7th of January where 17 people were killed by what some are saying was a terrorist attack. Unless you live under a rock, chances are you also heard about it. But what exactly happened? Why are people rallying? Why did terrorists target Charlie Hebdo? Why, why, why? First the WHAT! I am writing these words exactly 7 days after the 3 day terror began on the 7th of January 2015 where twelve people were killed at the offices of Charlie Hebdo, a French satirical magazine that publishes controversial cartoons. On Thursday, immediately following the tragic events at Charlie Hebdo, there was a fatal shooting of a police officer by a third person who was linked to the first attack. After killing the police oficer, he then entered a Jewish supermarket and took hostages, 4 of which he murdered. A total of 17 people were killed! WHY? Part of the reason I am writing about this is for myself. So I can make sense of it all. Writing helps me think. Another reason is to perhaps give you; a little perspective from someone who is not a French citizen but who was living in France when the incident happened. And maybe shed some light on certain nuances that you can only understand if you actually live here in France. Muslim extremists took credit for the attack. Here in France, they have shown footage of the killers admitting they were funded by Al-Quaida branch in Yemen and that the attack was carried out in order to avenge the honour of the Prophet Muhammad. The three people who carried out the terrorist attacks were all French born. French born brothers carried out the attack on the Satire magazine Charlie hebdo but were of Algerian descent. Both the brothers were well-known to French police, and their names were on the U.S. ”no-fly” terror lists for years. The supermarket attack was carried out by one man who was French while his wife is said to have fled the country and was last seen near the Turkish-Syrian border. All three men were killed. What has it been like for us here in France? Although my family and I live in the South of France, about 10 hours drive from Paris, the effects are being felt just as strongly. There is a tenseness in the air that is hard to explain. There are roughly 5 million Muslims living in France. Many of which are 2nd and even 3rd generations French born. The divide between the Muslims and non Muslims has always been present but now it seems some French people are using this event to lump all Muslims into one basket and retaliating against innocent muslims. There have been numerous attacks against Muslims, including several mosques and even a kabob shop that was blown up. (Kabab shops are all over France and are usually run by someone of Arab descent). 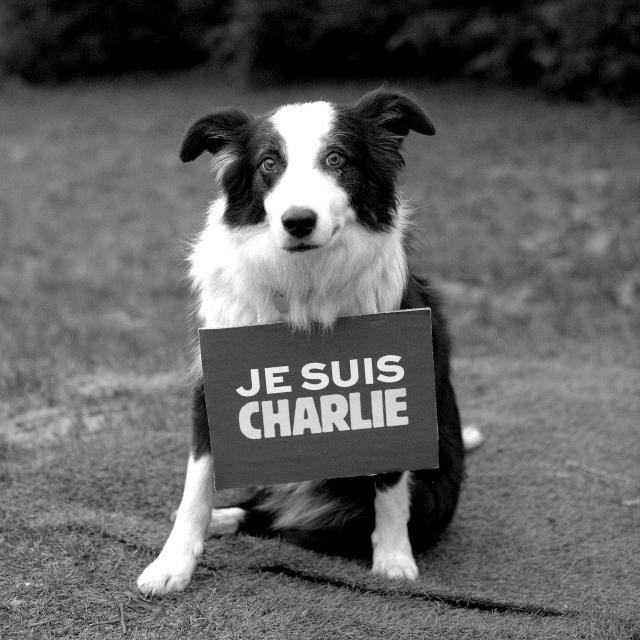 The news is non-stop about the events and everywhere I go, I see signs posted that say “JE SUIS CHARLIE”. France remains on high alert while investigators determine whether the attackers were part of a larger extremist network. Unity Rally: It is estimated that 3.7 people gathered around France. Most of Europe and certain parts of the world are rallying together in solidarity against what happened under the phrase JE SUIS CHARLIE. On Sunday, the 11th of January, France had it’s largest Rally in history. Over 1.6 million demonstrators surged through the streets of Paris behind over 50 world leaders walking arm-in-arm Sunday in a rally for unity described as the largest demonstration in French history. Millions more marched around the country and the world including London and Ireland. 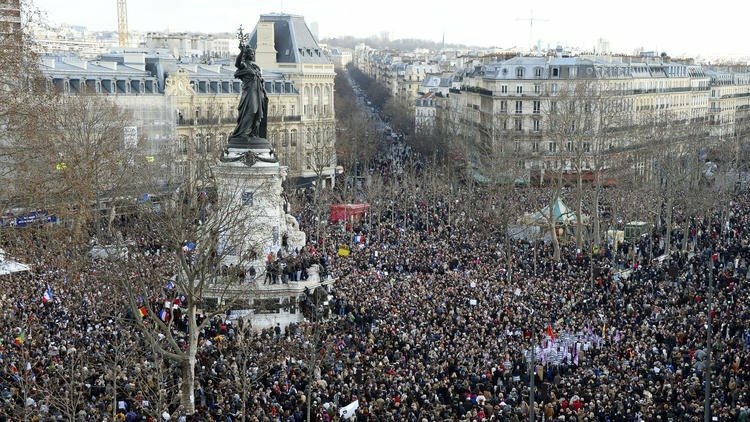 It is estimated that over 3.7 million people rallied across France in unity to defend freedom of speech and western democratic values against terrorism. More than 5,500 police and soldiers were deployed that Sunday across France, guarding marches, synagogues, mosques, schools and other sites. My son’s whole high school class skipped school to attend a Rally in Hyeres France where he goes to school; as did many schools across France. 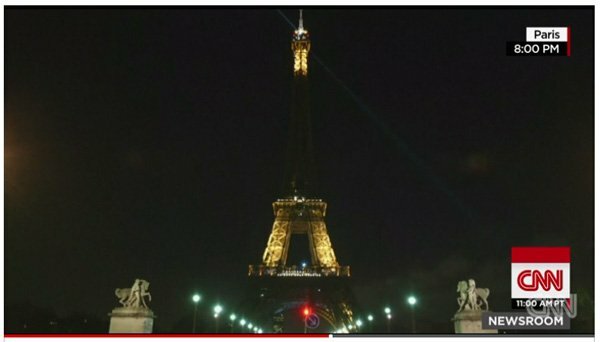 The Eiffel tower went black for a minute of silence at 8 pm on Thursday. This is just what happened in the last 7 days. 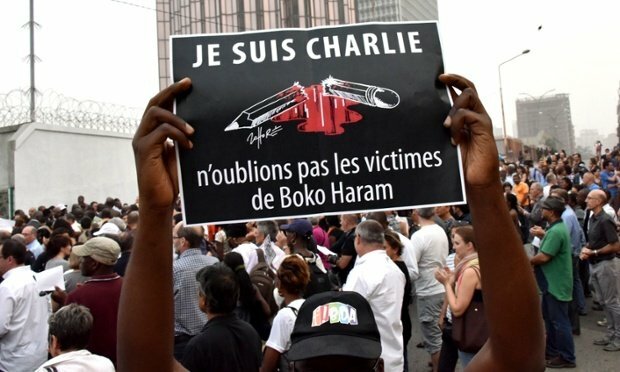 The slogan “Je suis Charlie”, which means “I am Charlie” is meant to identify the speaker or supporter with those who were killed at the Charlie Hebdo shooting. Therefore when you say “Je suis Charlie”, you are in essence a supporter of freedom, of speech, and resistance to armed threats. Some liken the phrase or say that the meme or slogan is closely related to the phrase made by John F. Kennedy’s at the Berlin wall in his 1962 speech where he says “Ich bin ein Berliner”. The phrase which roughly translates “I am a Berliner” was said to express America’s support for the people of Berlin by literally claiming himself as one of them. 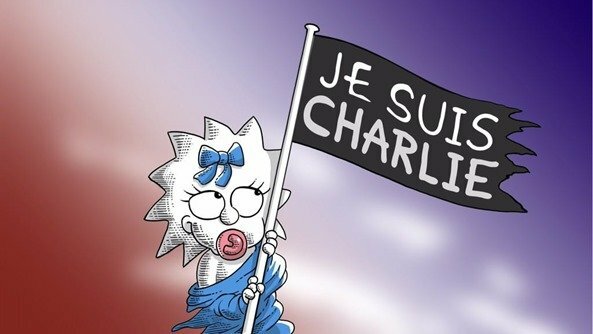 2015 : Charlie Hedbo : “Je suis Charlie” -> I am Charlie, meaning we are all like Charlie people, we suffer from the loss the same way they are, and are as outraged as they are. How Did the Slogan “Je Suis Charlie” Start and spread so far and fast? It’s a message that was supposedly started by Joachim Roncin, an artist and music journalist for Stylist, who posted on twitter one hour after the attack; (#JeSuisCharlie). Within the span of 24 hours, the slogan went viral on twitter and it’s estimated that close to 65,000 tweets were being tweeted per hour. A record for even twitter. 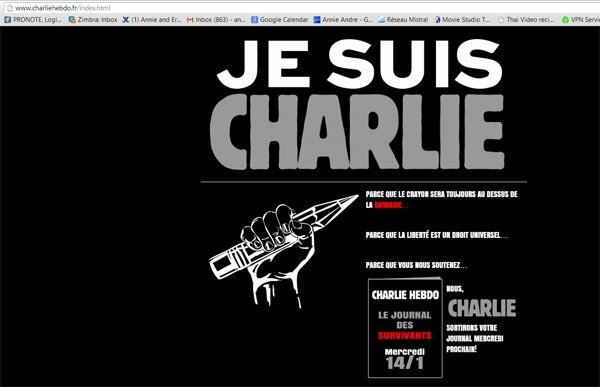 Shortly after the attack, Charlie Hebdo went offline and when it returned it bore the Je Suis Charlie on a black background. (The above photo is a screenshot I took of their website). The statement was then not only used as a hashtag on Twitter (#jesuischarlie and iamcharlie) but people across France and the world printed or hand-made signs, stickers and displays at vigils and on many websites, particularly media sites and social networks. Supporters: How are they showing support? 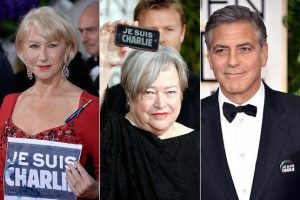 Many people around the world are showing support and spreading the word including well known stars who attended the Golden Globe awards by carrying signs and buttons that said “Je suis Charlie”. 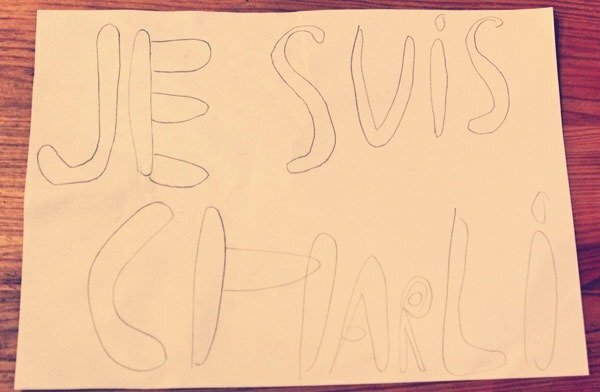 Artists around the globe showed their support by drawing their own rendition of the Je suis charlie slogan. 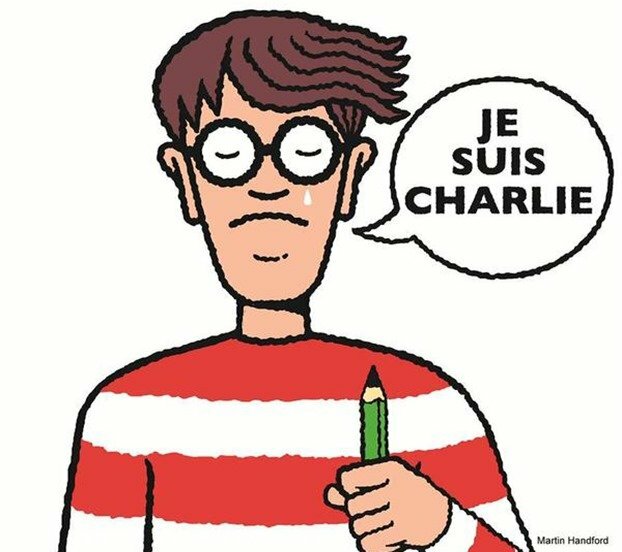 Martin Handford,the illustrator for the “Where is Waldo” series which is actually called “Ou est Charlie” in France, drew his famous character in homage of the recent events also. Found on facebook, don’t know who this is by. What is Charlie Hebdo and why were they targeted? 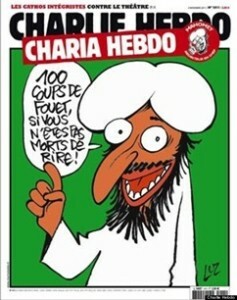 Charlie Hebdo which roughly translated means “Charlie Weekly” is a French satire magazine best known for publishing cartoons that mock and criticize Islam; Islamic extremism, and the prophet Mohammed. (the main reason the terrorists claimed they targeted the magazine). Many Muslims consider portrayals of the Prophet Mohammed to be a serious insult and religious offence. By design, the cartoons were supposed to be raunchy, crude and made to provoke. Some people are saying the magazine was asking for it because of the type of messages they put out in their weekly issues. While the drawings were shocking, you should understand that the French brand of political satire called “gouaille”, (meaning banter) is a very different form of satire than the American political satire in that it is based on free thinking love of provocation that stands against authority. Parisians even pride themselves on “gouaille. 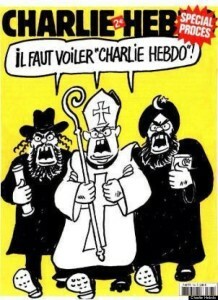 Blasphemy is a national pastime, not a dirty word in France. This was not the first time Charlie Hebdo was targeted, nor was it the first of it’s type. Watch the video below to get a little background on this. 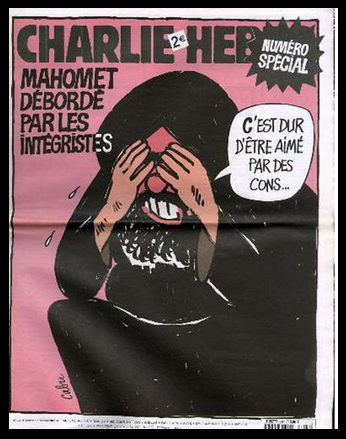 I am not sure if you remember this but back in 2005, there was a similar event where a Danish newspaper published 12 cartoons, most of Muhammad, in the same way that Charlie Hebdo did. The cartoons sparked riots that left more than 250 people dead around the world. 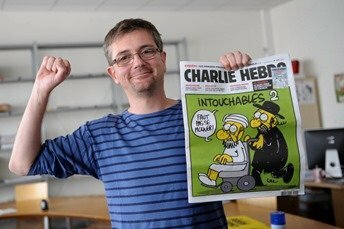 5 years later, Charlie hebdo was firebombed after it published an issue where they jokingly said the issue was “guest-edited” by the Prophet Mohammed (“100 lashes if you don’t die of laughter”). 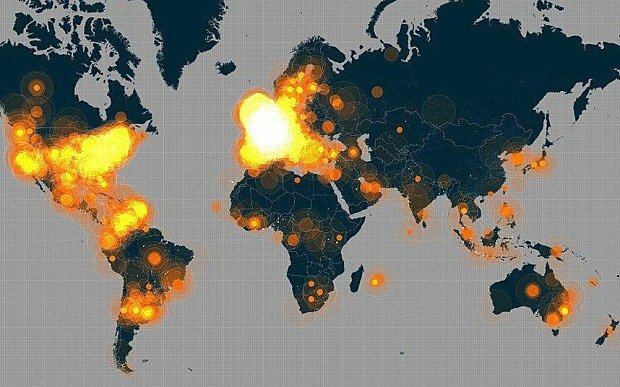 Counter-hashtags have appeared as expressions of disagreement with the unconditional support of Charlie Hebdo. JeNeSuisPasCharlie (I am not Charlie) has been used by those who accuse the magazine of racism. 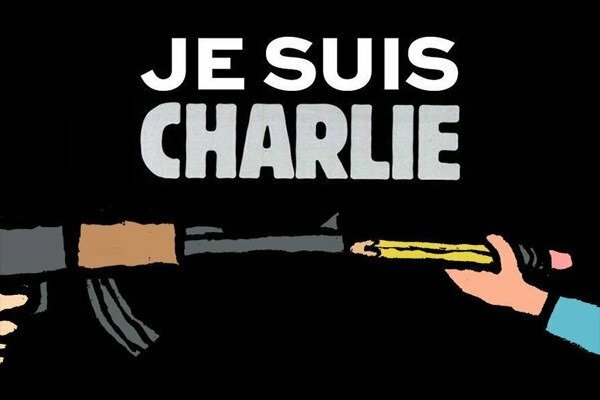 JeNeSuisPasCharlie has been used around 20,000 times by critics of Charlie Hebdo according to BBC News. Other people have said that they brought this upon themselves by mocking the Muslim religion. I am not sure if in the US or the world for that matter, if the media pointed out that Charlie hebdo also poked fun at Christianity, Judaism and anything else in a position of authority including it’s own president. Past covers include former French President Nicolas Sarkozy looking like a sick vampire and an Orthodox Jew kissing a Nazi soldier. 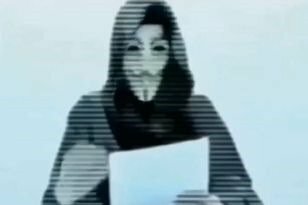 Hacktivist group Anonymous has promised to avenge the attacks and a Belgian ‘branch’ of Anonymous posted a video message to YouTube describing a new campaign against Jihadists, called OpCharlieHebdo. 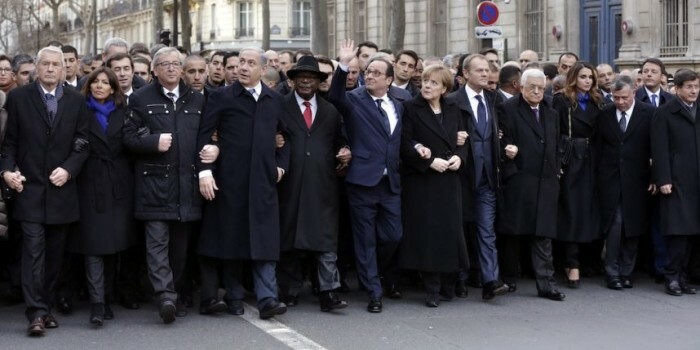 I have been watching the news coming from the US via the internet and have seen all the questions and statements regarding Obama’s absence where over 50 world leaders marched together in unity on the Sunday following the terrorist attack. In fact, there seems to be a lot of talk about him not attending. But it’s not just American media that is taking notice. The French media noticed too. But the French’s coverage of Obamas absence has not been as prolific as the American coverage. It’s been a blip on the French radar. The French have been doing a great job of keeping most of focus on the fight. Part of me says Obama should have been there but part of me also wishes the media would put the focus on what happened rather than Obama’s absence. Even the White House acknowledged their mistake so let’s move on. Is it safe in France? What happens now? Because the gunmen were Muslim French citizens, some are saying that this is the beginning or the trigger for a civil war. Remember, I said that there are over 5 million muslims living in France. I don’t know if Islam-phobic is the right word but there is definitely a great divide between French and the Muslims. This isn’t something I heard on the radio, this is the sentiment that I know exists after having lived in France for years and hearing how many French people talk about Muslims. It can make one very uncomfortable. For instance, the time one of my friends justified certain racial comments against some Muslims at our daughters school by saying “well it isn’t racism if it’s true”. This attack by Muslim extremest has probably deepened that divide even though I know for a fact that most Muslims here in France do not condone the actions of a few extremists. I have been hearing stories on twitter, in forums and through friends of friends who say that they feel like hey are being targeted for being “’foreign looking” (i.e. non-white). Stares from armed police. People yelling at them from their cars. Many people have emailed me saying they want to take a trip to France and they want to know if it is safe? I should’t laugh because many French people have asked me if it was safe to travel to the US considering there are mass shootings at schools which seems to happen at least once every couple of years. So is it safe? Let me ask you this. If you are living in the US, did you feel safe sending your kids to school after hearing about crazy gunmen shooting down children in public schools? Did you feel safe after 9/11?. Nothing in life is safe or guaranteed and no one could have foresaw the events in Paris this week .All you can do is get on with living your life, otherwise the terrorists have won. Photo of the editor who was the main target of the Charlie hebdo attack. So yes, I feel as safe as I did when I lived in the US and Canada. Why are so many people rallying in support of France now? Despite the fact that many people are saying that the magazine brought this upon themselves. I am not one of them. Many people, including myself believe the reason so many people are coming out in support and standing united against terrorism is to show “them” that we believe in our right to freedom and that we do not fear “them”. The French have shown such a tremendous amount of unity. I can honestly say I have never in all my years on this earth been part of and seen first hand this widespread support. They are coming out in support of freedom. For now, the world is taking a stand for free speech. Proclaiming the pen mightier than the sword. If we’re too afraid to speak out against “them”, then the terrorists have won. I know that most people reading this blog are Americans. I leave you with this last final thought. Just days before the attack in Paris, over 2,000 people, mostly the elderly and children were massacred by Boko Haram across northern Nigeria. But the world seems to have not taken as much notice. Some people are asking why did the Paris attacks receive more coverage than the Niegerian slaughter? I can’t answer why this happened. You should read about it and help spread the word.